Today’s building, shown here shortly after it was built and opened in 1912, was placed on the footprint of the town’s original music hall. In 1912, Fenway Park first opened, the Oreo was invented, and the Titanic sank not far from the Maine coast. It was also the grand opening year of the Stonington Opera House on Deer Isle. The Opera House has been used as a venue for movies, vaudeville performances, high school graduations, town meetings and many other community events. Today not much has changed, as the Opera House shows “stewardship to the community,” says executive director Linda Nelson. 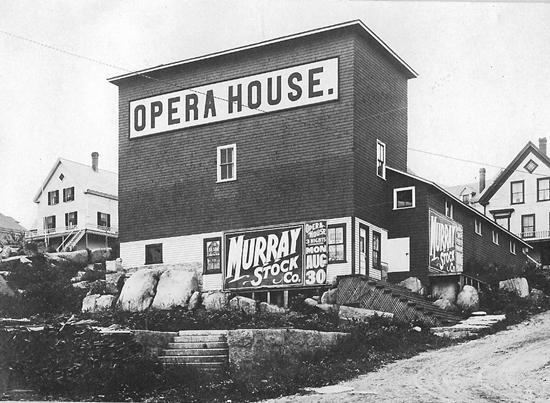 The Opera House continues the tradition of entertaining Deer Isle and Stonington. It still has the same popcorn machine from the 1920s and a movie screen from 1914. The Stonington Opera House is not the only coastal entertainment venue in Maine still in operation. Lincoln Hall in Damariscotta, the Waldo Theatre in Waldoboro and Hammond Hall in Winter Harbor are similar to the Opera House and entertain their coastal communities. The Opera House has planned many events to celebrate its 100th anniversary. Movies from 1912 to 2012 will be shown to the public for free, in honor of the movie projectors that were installed in 1918. Burt Dow, Deep Water Man, an original opera production of author Robert McCloskey’s children’s book, has returned to the Opera House for its second year running. Maine author and historian Earle G. Shettleworth Jr. will present postcards of the community from the 20th century on Sept. 12 at 7 p.m. These postcards will display visuals of the Opera House from the past, views of the waterfront, villages, individual buildings and visible features of Stonington quarrying operations. Over the years, community members have kept the Stonington Opera House going strong. “I have been volunteering at the Opera House for longer than I can remember,” said Sarah Wilson, a senior at Deer Isle-Stonington High School. She started at a young age by helping take candy out of cases for the concessions. As she got older, she gained more responsibilities such as selling concessions, making popcorn and working at the cash register and box office. Wilson now works year-round as house manager and has a full-time position in the lower box office during the summer. “I also still volunteer regularly and have found that I enjoy volunteering for shows even more than I enjoy being a patron,” she said. The Opera House has an eventful year ahead as it continues its centennial celebration. For more information, please visit www.operahousearts.org. Marissa Donovan is a resident of Deer Isle and participant in The Working Waterfront’s Student Journalism Program.